Is the Sun and its planetary system special? How did the Solar system form? Are there similar systems in the Galaxy? How common are habitable planets? What processes take place in the early life of stars and in their surrounding circumstellar disks that could impact whether life emerges or not? 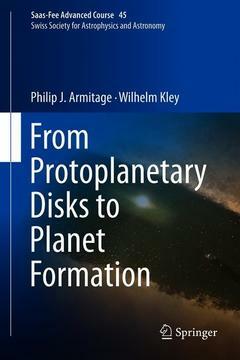 This book is based on the lectures by Philip Armitage and Wilhelm Kley presented at 45th Saas-Fee Advanced Course ?From Protoplanetary Disks to Planet Formation? of the Swiss Society for Astrophysics and Astronomy. The first part deals with the physical processes occurring in proto-planetary disks starting with the observational context, structure and evolution of the proto-planetary disk, turbulence and accretion, particle evolution and structure formation. The second part covers planet formation and disk-planet interactions. This includes in detail dust and planetesimal formation, growth to protoplanets, terrestrial planet formation, giant planet formation, migration of planets, multi-planet systems and circumbinary planets. As Saas-Fee advanced course this book offers PhD students an in-depth treatment of the topic enabling them to enter on a research project in the field.